In honor of my dad who passed away on December 22nd of this year, I am re-posting this article from February 2015. “It is Well With My Soul,” was his favorite song. 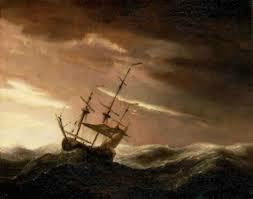 Stepping onto the gang plank, a fresh wave of sorrow washed over Horatio. So much grief; so much sorrow. How much can one man endure? Tears formed like small pools at the bottom of his eyes. Once the dam broke, there would be no stopping the flood that was sure to follow. Thinking back over the past two years, Horatio Spafford had endured so much pain in his life. First, losing his son to a tragic death, he then lost most of his investments to the great Chicago fire of 1871. And now, he was headed to England to join his sweet Anna in saying goodbye to their four daughters who had died tragically at sea. With a sigh, Horatio headed to his cabin. Several days into his voyage, Horatio was summoned to the bridge by the Captain. With deep sadness, the Captain shared that, after careful reckoning, he believed they were approaching the site where the ship carrying his wife and daughters had sank. Only his wife Anna survived to make it to England. Why do certain tragedies occur? I would love to give you a satisfying answer, but it would be futile in the midst of your sorrow. However, I do know this; our Father will never leave us nor forsake us. Because of this I can confidently declare, “No matter my lot I must continue to say, “It is well, it is well with my soul.’” Be blessed. ‹ So… You Want to Reach the World, Do You? I am so sorry for your loss, Patrick. Although you know where your father is, still the loss can cut so deep. I love this song, too. Forty years ago my son and daughter, who were 5 and 2 years old at the time, were abducted from me. During the 2 years and 7 months that my children were lost to me, before I finally got them back, my grief was nearly unbearable. One day I poured my heart out to an older Christian woman. This song was playing in the background. When I finished speaking, the woman gently told me the story behind the song. And I began to understand how it could be well with my soul, even while my heart was shattered. Thank you…Pop’s and I had a good talk about a month ago about this just being a short departure until we meet again. *hugs* prayers that His love will surround and comfortable youbnow and always. Thanks Jules… You are always so sweet. Patrick, my thoughts and prayers are with you and your family. Beautifully said, Pat. Love you! Thanks Neta…It will not be long till we all are together again. I’m really sorry to hear this Patrick many thoughts and prayers. I’m so very sorry for your loss, Patrick. May our God of all comfort be your rock and strength at this time. Was your dad an influence on your faith life? At some point I’d love to hear your remembrances of him, if you’d care to share. Much love and prayers for you and your family, and a blessed Christmas to you all. Yes’m…He was an influence. He was an example of walking love. He never met a stranger. Pastor Jim, to be honest, this was one of the best Christmas’ I’ve had in recent memory. Jesus said, “My peace I give to you…” I made a choice to be happy and He fulfilled His promise by providing the peace which passes all understanding. I’m sorry for your loss, Patrick. What a beautiful post and a sweet tribute to your dad. Sometimes when a life is well lived and you know they are now in good hands, rather than sadness, there is a sense of peace, even perhaps some moments of joy. My own father’s passing tossed me all about, but I still could not shake the feelings of peace and comfort that came to me, His peace. His comfort. All is well with my soul, indeed. Thank you my friend… You always put a smile on my face. My dear friend – I am so sorry for your loss. My heart goes out to you and your family. I know first hand what it is to loose a loved one during the holiday. I do not have any words to say that could give you any comfort during this time except to say I know that you know he is in a much happier place waiting for all of his loved ones there. We will all be together again soon. I love you my friend. Thank you Lynn…I really appreciate you. Yes’m, he is in a much finer place and I will see him soon (in the grand scheme of time).